Reliance Foundry’s line of removable bike bollards offer bike storage while allowing access to be granted or restricted in changing streetscapes. This installation method uses padlocked chains to fasten bike bollards. When bike bollards are removed, chains can be stored inside receivers and concealed with a protective cover to prevent tripping or obstruction. Removable bike bollards act as visual traffic deterrents that can restrict or limit access to particular areas while providing secure bike storage. It is important to note that with this installation method, bike bollards offer limited impact resistance. Please consult your local Building Code Department to determine the recommended digging depth below the frost line in your area. Choose this or 12″, whichever is greater. Then add a minimum 6″ for holding the drain rock. * This is your total digging depth. The diameter of the hole should extend a minimum of 10″. Note: If the recommended digging depth below the frost line is greater than the depth of the receiver, be sure to provide adequate drainage by piping through the concrete and connecting to the drain rock layer underneath. Use a dirt tamper** to compact the soil below the intended surface. Keep the bike bollard in its protective packaging. Keep in mind that the receiver will be installed so that the receiver is level with the finished grade and a slight berm is recommended. Add the drain rock to the installation site. Place the chain of the receiver inside the receiver. Lower the receiver into the designated location so its top is above the surface grade. This is recommended in order to create a slight berm with the concrete. Note: If necessary, temporarily insert the bike bollard (with packaging still on) into the receiver and use a level to ensure it is plumb. Ensure the concrete has cured. Keep the bike bollard in its protective packaging. Carefully set the bike bollard near the installation site. When ready to install, remove the protective packaging and lower it into the receiver. 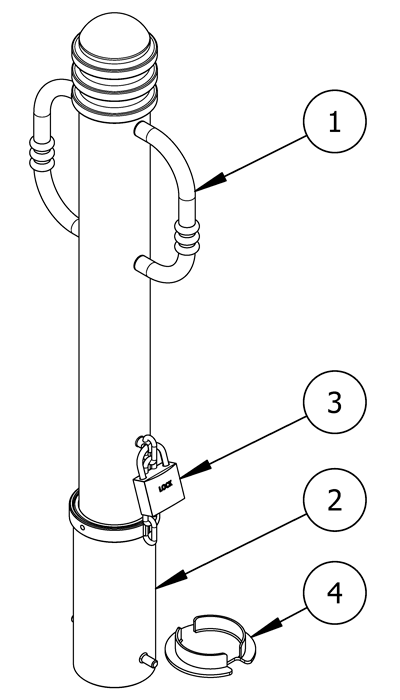 Lift the chain of the receiver up to the stud and use a padlock to connect the two together. Fasten the padlock. Note: Chain receivers are available with an optional cover to minimize tripping hazards. If a receiver cover is being used in this installation, lift it along with the chain and secure it with the padlock. 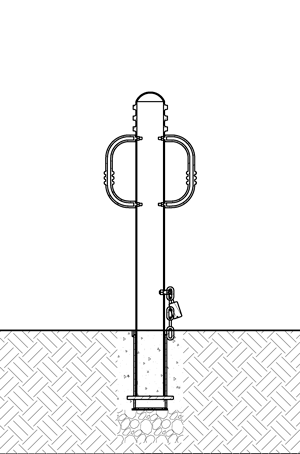 Removable bike bollards can be installed using receivers with chains.